For nearly a month Miami Dade College’s Museum of Art + Design (MOA+D) hosted Alma Leiva’s exhibition, Object of My Affection: San Pedro Nos Ve (San Pedro Watches Over Us). During this span of time Leiva channeled the nearly real-time voice of Honduras’ lost youth into the MOA+D, which occupies the Freedom Tower. 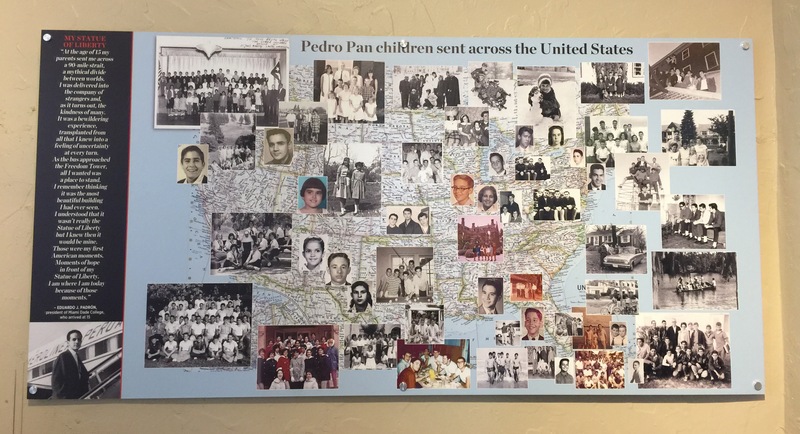 Between 1962 and 1974, this building served as a processing center for Cuban refugees. Despite this brief history, Freedom Tower remains a potent symbol of freedom within Miami’s Cuban-American community to such an extent that there are permanent exhibitions documenting the Cuban experience off the entrance lobby. One of the most remarkable elements on display is a map of the U.S. highlighting the Operation Peter Pan experience. Dozens of historic photographs dot the expanse of the United States, potently bringing to life the story of the American dream as a salvation for all the children air-lifted out of Cuba in the 1960s to the comfort of homes in nearly every state of the union. 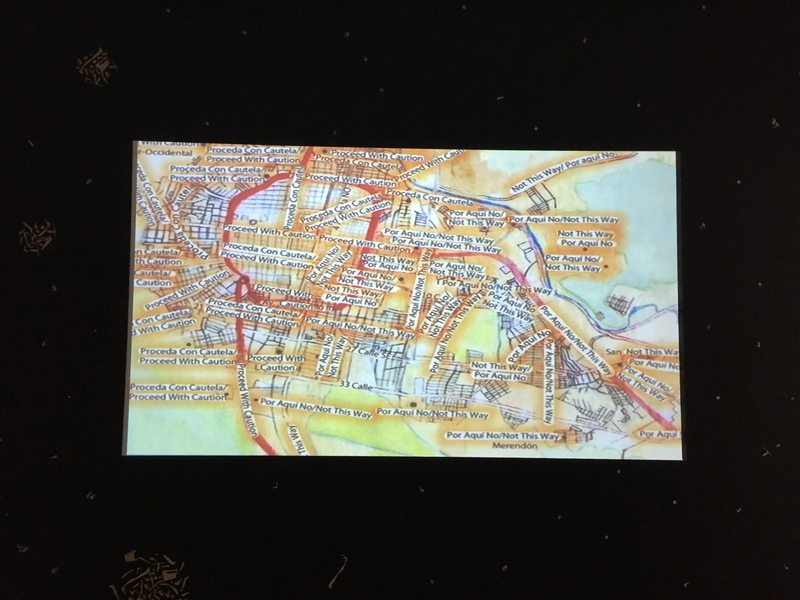 One floor above this map, Leiva’s exhibition features Survival Map for the Outsider / Mapa de superviviencia para el forastero (2014-2015), a video animation of San Pedro Sula. The clip begins on a blank canvas, progressing into streets, and culminating with warnings: “Proceed With Caution” (“Proceda Con Cautela”) ; “Not This Way” (“Por Aquí No”). Once the entire city has been populated with these warnings, the animation reverses, and returns to a blank state. The economy of Object of My Affection—three videos, the animation, and an installation of paper cut-outs—enables Leiva to dwell on the blunt reality of life in Honduras. Indeed, one could include the introductory wall text citing this small Central American nation’s alarming murder rate as the sixth element in the show. In addition to the video animation, the three other videos also engage the topic of violence in Honduras. Two of the videos, which is actually one video displayed in two languages (English and Spanish), features a Skype video chat with José, a young man living in San Pedro Sula. 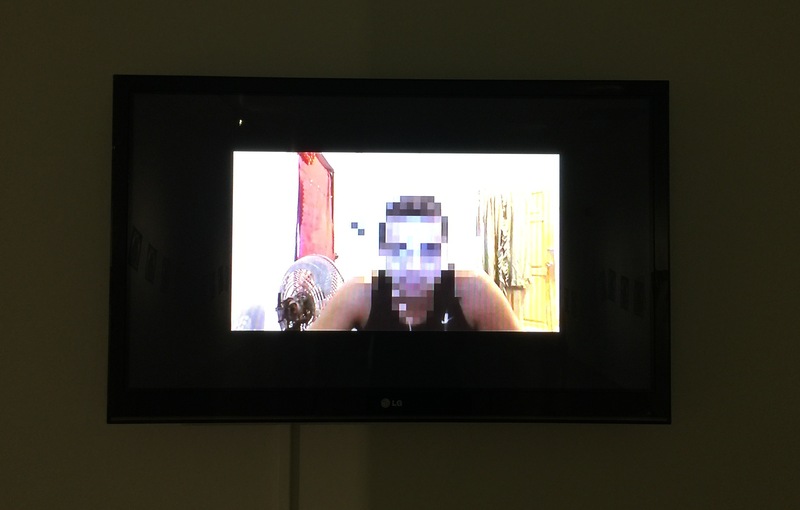 To protect his identity Leiva has pixelated his face and altered his voice in Conversations from the Other Side 1 / Conversaciones Desde el Otro Lado 1 (2015). In the English version, the translation is nearly robotic while in the Spanish video the audio is mostly inaudible. Not only are work opportunities few and far between for young people like José, but the simple pleasure of going out to dance on a Saturday night is stymied by suspicious gang members who stop ordinary citizens on the street to reinforce that they control the citizenry’s circulation. Indeed the importance of knowing where to go and where not to go is an essential form of knowledge for San Pedro Sula’s populace, as Leiva highlights in her works. This goes hand in hand with the need to communicate in code, whether this results in dubbing the monologue of someone like José or the collage Leiva creates on coffee-stained paper. 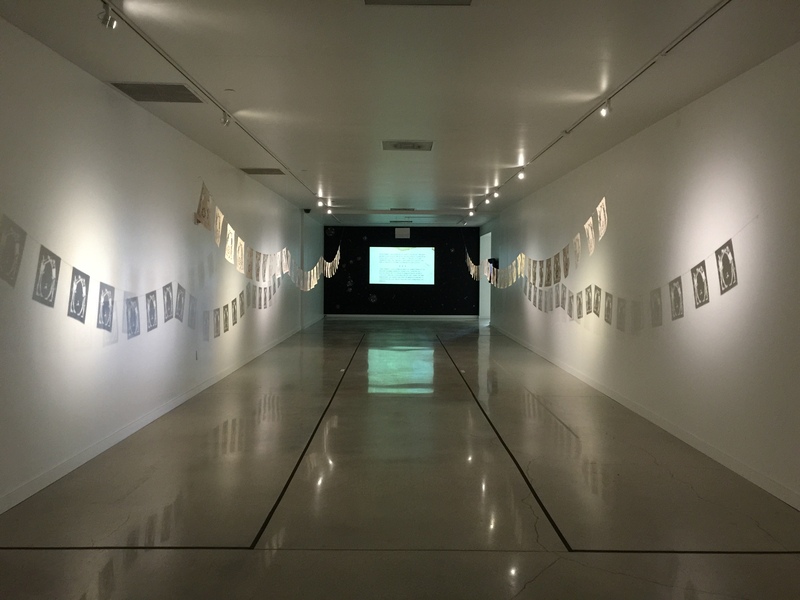 The videos of José are lined by two rows of panels linked together in a paper chain in an installation titled Object of My Affection (2014-2015). 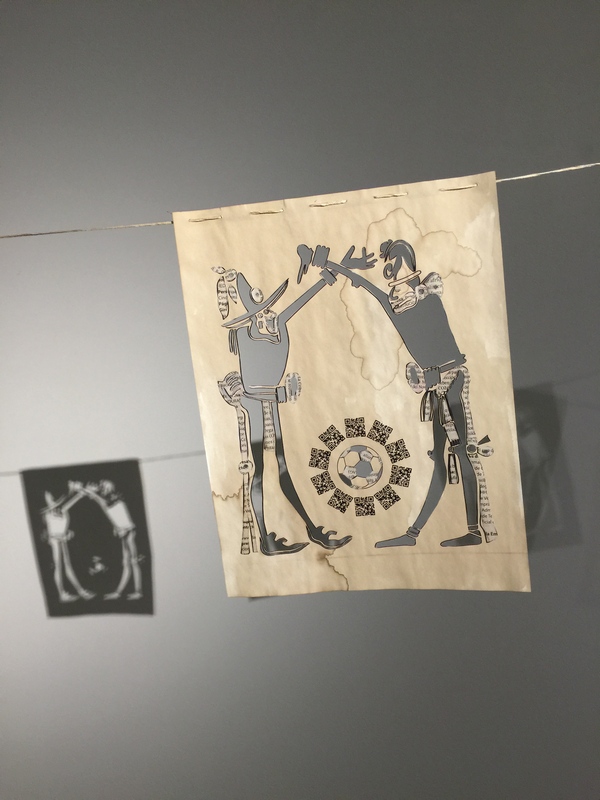 Each panel depicts two pre-Columbian figures from Mayan folklore—Hunahpú and Xbalanque—hovering over a soccer ball on a coffee-stained sheet of paper. These three elements are composed of cutouts, with some of the open spaces (the bodies and clothing of the figures as well as the ball’s honeycomb) filled in with print from a Honduran newspaper. A halo of ten QR codes—which lead the visitor to personal stories of violence in San Pedro Sula— surrounds the ball. The Spanish writing and QR symbols are exercises in coded language. In addition to representing distinct languages their very presentation is mostly indecipherable—the Spanish writing has been chopped up while the QR code can only be read by a smartphone. Moreover, the Mayan figures recall an age before either language. The arrangement of these panels recalls the colorful Tibetan Buddhist prayer flags, which are full of symbols and scripts. These flags are gestures of peace and the Buddhists believe the winds will disperse these hopes. As people outside of Tibet display the flags the world is reminded of the Tibetan diaspora’s political struggles against China. Leiva’s panels juxtapose distinct cultures and periods of history, therefore they are thematically unlike the Buddhist prayer flags. Yet the aesthetic affinity as well as the hope for peace in the face of despair, connect both sets of flags. One of the most moving moments of José’s talk came when he spoke about his mother. Though he is in his mid-20s, he could still recall the day his mother left to work in the U.S. a decade earlier. Of all the things José discussed this recollection caused his voice to waver and his pixelated head to move around the screen in distress. José is among the thousands of children set adrift by the upheaval gripping Honduras since 2009. An upsurge in violence brought this instability to the U.S.’s doorstep in 2014 as 68,000 unaccompanied children from Central America flooded the border with Mexico, seeking asylum. However, these children did not receive the Peter Pan treatment. Instead they are detained in often deplorable and crowded conditions as they await a court hearing. Because the minors are not considered refugees but immigrants, they are often deported; and since then many of these youths have been coldly murdered upon returning to their home nations, as in the case of several Hondurans. Leiva’s exhibition brings to the fore the chaos currently affecting Honduras’ youth. The narrative that shaped the Freedom Tower’s history—Cuban refugees seeking political exile in the U.S.—is hardly finished business, especially given Miami’s proximity to Cuba and the longevity of Fidel Castro. Yet, what can we make of the stunning bloodshed presently ravaging Honduras? How can sites like the MOA+D respond to real-time savagery when their own history has been shaped by events that happened over 60 years ago? Through the deft deployment of a few works, Leiva’s exhibition forces such uneasy conversations. Reblogged this on Blog by Doris. This is a brilliant piece of work juxtaposing many genres; periods of history; politics, culture and bringing to life the terrible agony of children who are homeless in body and mind. Alma Leiva confronts and relays the violence which occasioned(s) this situation with compassion, understanding and grace.